OK, it's time to look silly in your red-blue glasses again! When Tanya Harrison sent me those awesome 3D views of Olympica Fossae from Mars Reconnaissance Orbiter's CTX camera, she sent me two other sets of 3D landscapes on Mars. 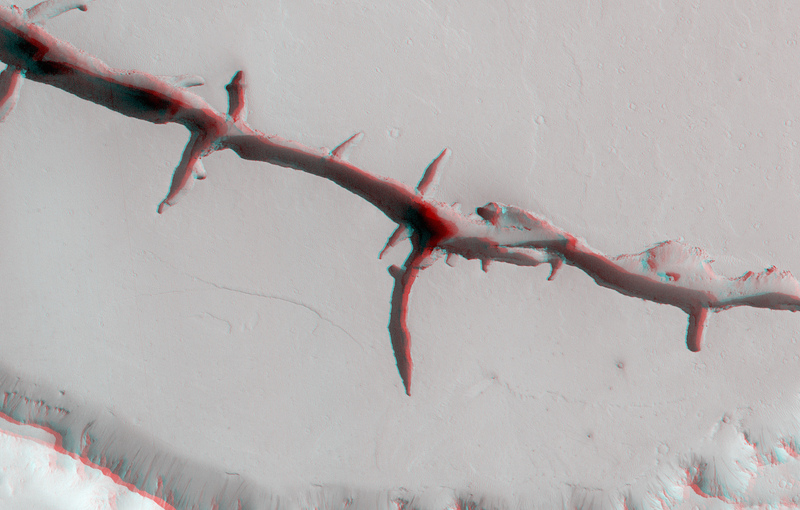 Here are some 3D views of some seriously deep holes in the ground in Cerberus Fossae, Mars. First, the context photo. We're looking at an unnamed crater about 35 kilometers in diameter, and there are two parallel canyons cutting it: one deep, branched one that cuts off its southern edge, and one smaller, narrower one in the crater's center. These are just a tiny piece of the Cerberus Fossae, which stretch hundreds of kilometers across Mars, cutting lots of other craters. This is a 3D anaglyph composed of two Mars Reconnaissance Orbiter Context Camera (CTX) images taken within the Cerberus Fossae region; view it with red-blue glasses for 3D effect. The crater is about 35 kilometers in diameter. A branched trough or "fossa" cuts off its southern edge, and another, smaller straight trough segment about 8 kilometers long lies in the center of the crater. Tanya wrote: "the Cerberus Fossae are a group of troughs in the Cerberus region of Mars that run roughly parallel to one another. They formed due to extension of the crust in the region. Some of the troughs are merely gaping holes in the ground, while others were at one time volcanic vents, emitting lava that flowed across the nearby Martian surface." How do you tell the holes in the ground apart from the volcanic vents? Tanya said "we can look for two things: visual identification of lava flow features emanating from the troughs, which can sometimes be seen in regular images of the surface; and evidence of accumulation of lava around the edges of the troughs." For both kinds of searches, you really need the kind of detailed topographic information that you can only get from having a 3D view of the surface. Tanya explains: "If the elevation gradually increases as you approach the edge of the trough, it was likely a vent in the past. If the elevation remains constant (and no flow features are present), then the trough was not a source of lava flows. In the image above, two large troughs can be seen: one cross-cutting a shallow, degraded crater and the other entirely within the crater. 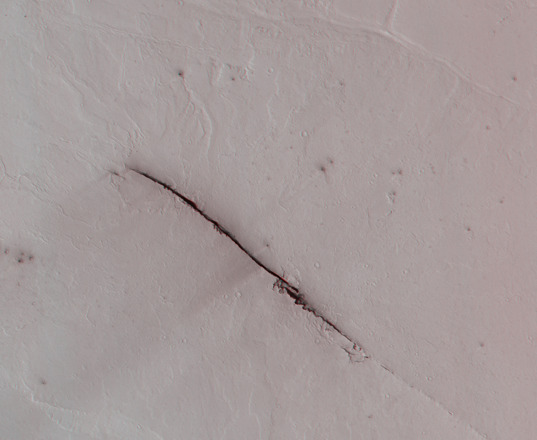 Flows can be seen emanating from the small trough, and in the medium and full-resolution images it can be seen that there is indeed a small elevation increase around the trough edges, indicating that it was a vent. The larger trough, on the other hand, does not appear to have flows originating from it, and the topography around its edges looks relatively flat in the larger images. Therefore, it was not a volcanic vent in the past." Here are gloriously high-resolution views of the two troughs. First, the wider, southern trough with branches. 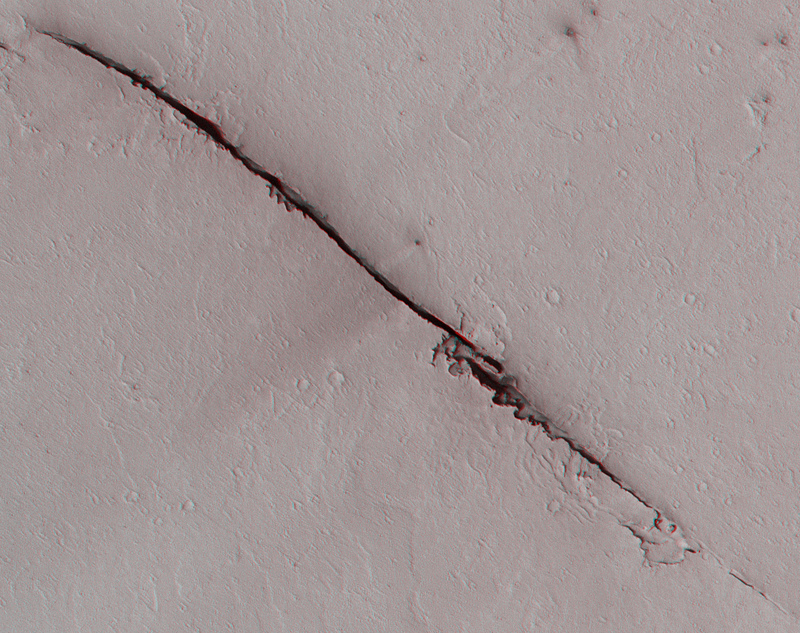 This closeup stereo view of one of the many troughs that make up the Cerberus Fossae on Mars comes from the Context Camera on Mars Reconnaissance Orbiter. Use red-blue glasses to get the 3D effect. The image is about 14 kilometers wide; the main trunk of the trough is roughly 500 meters across. What really strikes me about this picture is how very flat the ground is, then all of a sudden, whoops! There's a gaping hole in the ground. You'd best be careful how fast you drive across this part of Mars, lest you fall in! The other, smaller trough, which Tanya says is a vent, looks substantially weirder. In this version of the view, I can hardly see any topographic change anywhere. A Mars Reconnaissance Orbiter Context Camera view of a vent in the Cerberus region of Mars. Use red-blue glasses to get the 3D effect. The image is about 15 kilometers across; the vent is about 8 kilometers long. I cropped out a bit around the vent, and now the topography's a bit easier to see. A Mars Reconnaissance Orbiter Context Camera view of a vent in the Cerberus region of Mars. Use red-blue glasses to get the 3D effect. My impression -- though it's impossible to be sure -- is that some parts of the insides of this fissure are so steep as to be overhanging. You can see little squiggly flow features emanating from the trough, and it has funny scalloped edges.